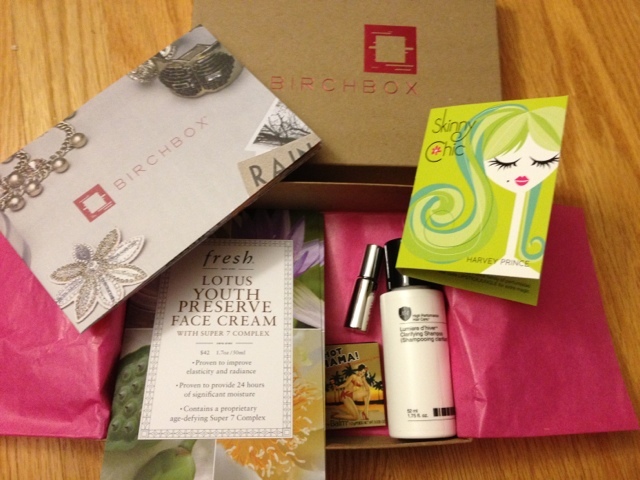 My January Birchbox arrived mid-month and with my new 2013 attitude, I sampled everything right away! I took a spritz of SkinnyChic which smelled lovely. I also swiped my finger against Hot Mama's peachy goodness- love it! I opened up the poster to read all things Birchbox recommended us to do for this year. Later that day, I used the clarifying shampoo - to switch out my regular one. It had a nice sudsy feel- but will continue to use it to see if I will actually get a full-size. The Fresh skin cream was incorporated in my night routine- woke up to smooth hydrated skin. Lash em serum - I waited until the weekend to try. Nothing drastic has changed yet..and unsure the little sample may bring any solid results. All in all, excited to see my box next month! Hope it's a good valentines themed one!